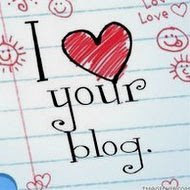 I have lots to share with you! My Lifetime Story begins in 9 Days! 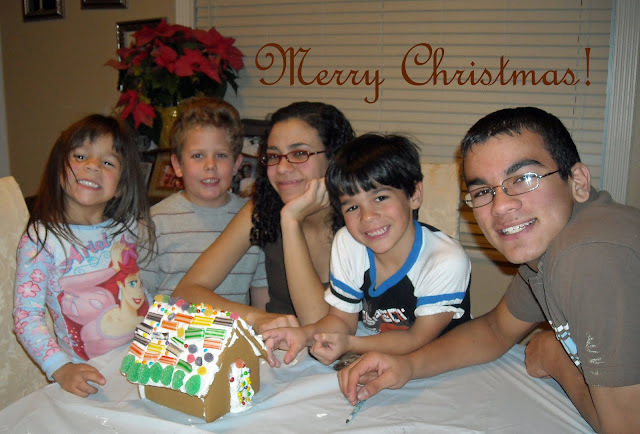 I hope that everyone had a very blessed Christmas! 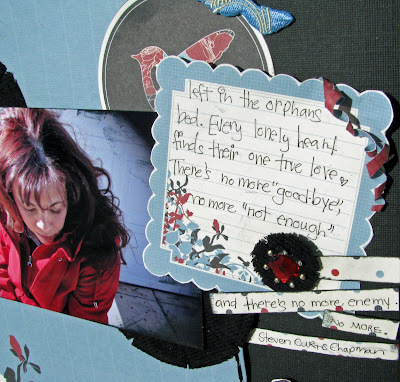 As 2009 draws to a close I am getting so excited about the My Lifetime Story Challenge! The My Lifetime Story challenge begins in only 9 days! The My Lifetime story challenges will begin the first Wednesday in January. 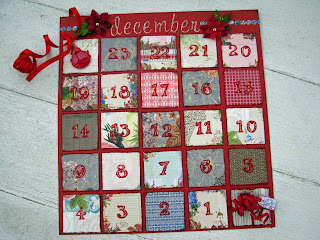 A new challenge will be posted each Wednesday all throughout 2010. This is YOUR autobiography. You will create this album about your lifetime story, you will be leaving YOUR LEGACY OF FAITH. This is an album that can make an impact in your life as you create it, but it will also create a major impact in the lives of your family both now and in future generations. 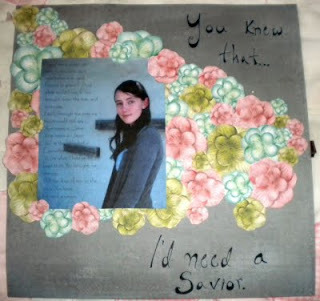 I have already had a peek and begun the prep work for my layouts and I have to say these girls have done their homework! 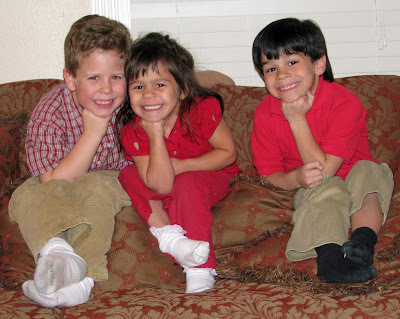 It's a little harder for me as I have no background info on my family (thats another story for another day) but I want to make sure my kids will have information that I did not! are having a cyber crop new years eve! 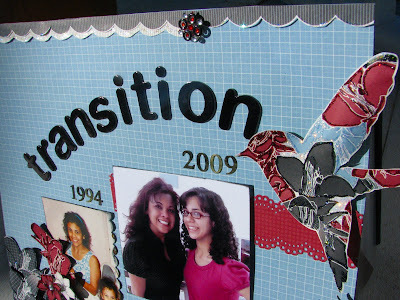 Scrapbooking! Now thats my kind of fun! What would you need to know or to believe to have a lasting inner peace? Have you ever felt it? What were the conditions that brought you that feeling? How much do you think you create inner peace as separate from your life circumstances? Please create your first PEACE layout about a time when you felt a sense of inner peace. 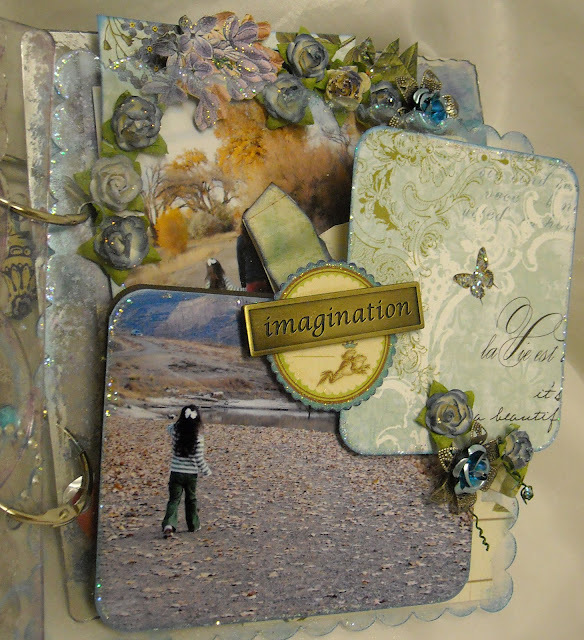 I also used one of my tags from above for this layout! Wishing you a little peace friends, thanks for stopping by! It is the night before Christmas and finally the kids are in bed! Oh my goodness they were excited today! I tried lots of things to keep them busy, stringing popcorn (that was messy) gingerebread house (not too bad see pic below),Christmas movies, stories and playing in the snow! It was a long day and I am happy they have settled down! In all the crazyness I was able to make this little tag today (Websters paper). 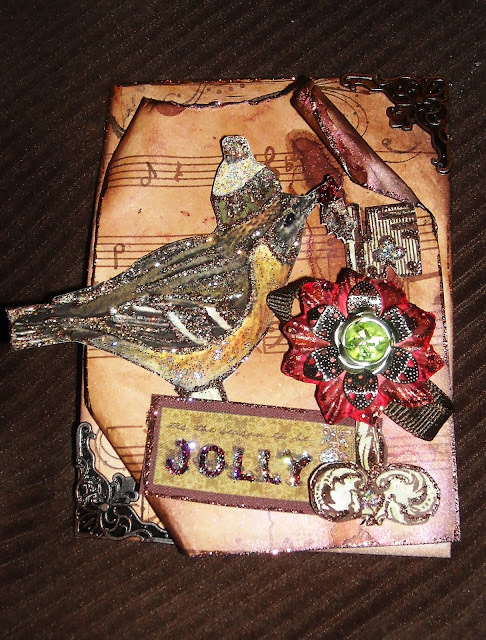 I am working on the 12 tags of Christmas from Tim Holtz blog. I have finished seven, I will show you next week! I had so much fun using lots of different techniques! 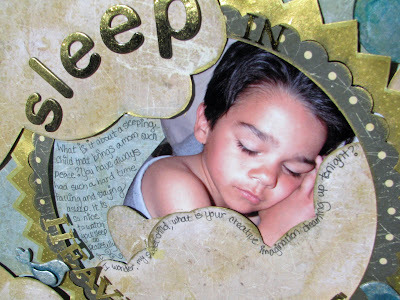 Moon glow spray to distress and add glimmer, Stickles to outline (more glitter), inking the edges, stamping and layering. LOOK at this sneak peek!!! 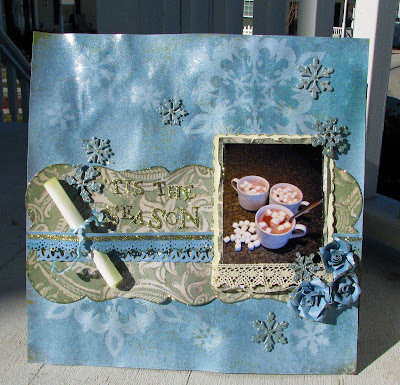 This is from the January kit at Scrapbooking From The Inside Out! What's really cool is you can win this kit! and register for our mailing list on the home page(scroll down) if you’re not already a member. If you are, you’re good to go! 2. 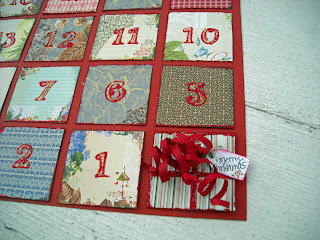 Leave a comment here http://scrapbookingfromtheinsideout.blogspot.com/2009/12/new-winner-and-our-christmas-giveaway.html on this post and tell us what you've learned about yourself this year. and let me tell you there are some cool things in this kit! Last but not least I hope that you have a wonderful Christmas tommorow!!! I pray that you find peace and recieve many blessings!!! God bless you and merry Christmas! Make sure you pause the music on my boom box below first! Tonight before my 7 year old went to bed he showed me 6 fingers - 6 days until Christmas! The kids are so excited! They just cannot wait until Chirstmas! I, on the other hand need those 6 days! 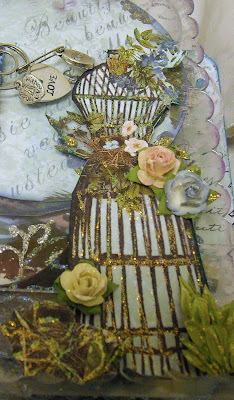 I have been busy doing projects that of course I cannot show on my blog yet! (Presents, design team stuff for next month - I'm sure you can understand!) Tommorow is the last day of performances! Hooray! I get to take a break! Well, for a couple of weeks anyways! Heres a little something I designed for the kiddos to be able to visualize how many days are left before Christmas without asking me a hundred times a day! (Papers are from Websters. )Today we had a dress rehearsal for tomorrow, I had some helpers come over and we made some surprizes (about 60) for the kids tommorow! Notice the tires on the car? 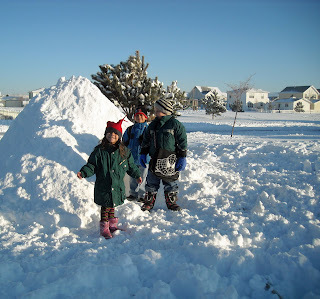 The kids built a little shelter with the neighbors. I hope you are staying warm where you are! "What would you need to know or to believe to have a lasting inner peace? Have you ever felt it? What were the conditions that brought you that feeling? How much do you think you create inner peace as separate from your life circumstances? 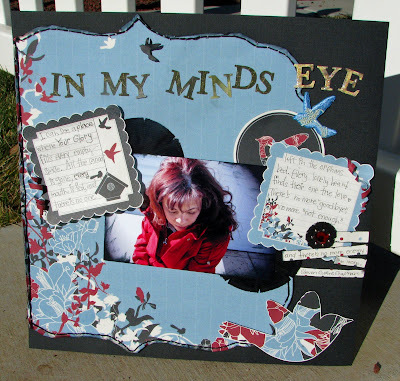 Please create your first PEACE layout about a time when you felt a sense of inner peace.For the design twist, please use something that opens and closes for a secret look inside..."
I cannot answer this without thinking about God and who He is in my life. I have inner peace and joy all the time regardless of my circumstances. I have peace and joy because I know who I am in Christ and that He is in control. When things settle down I hope to do this challenge on paper, it's good to reflect on God's goodness and I am a blessed person. If you have read this far I hope that you too find peace and joy daily, I hope that you will seek Him, especially now at Christmastime...After all He IS the reason for the season. OK has this ever happened to you - you do a post you are just about finished and you realize that it hasn't been saving and your internet goes out? Yep lost the whole thing and here I am again rewriting the whole post! Arrggg! Wow! 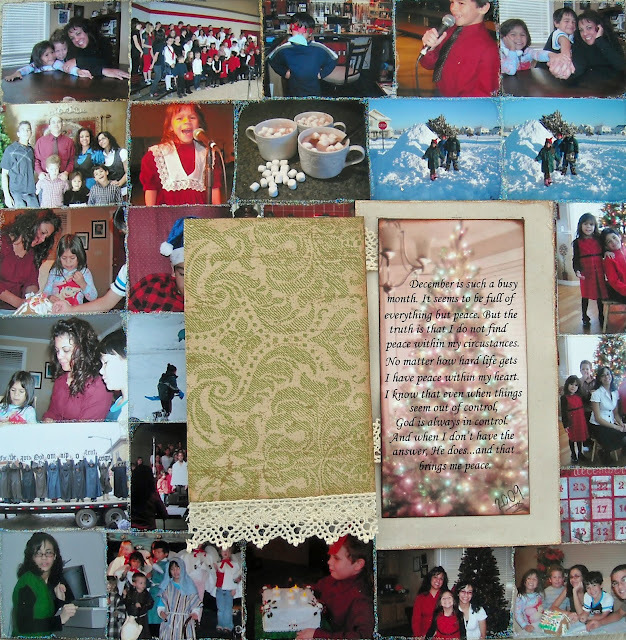 I cannot believe Christmas is right around the corner and I am completely disorganized! 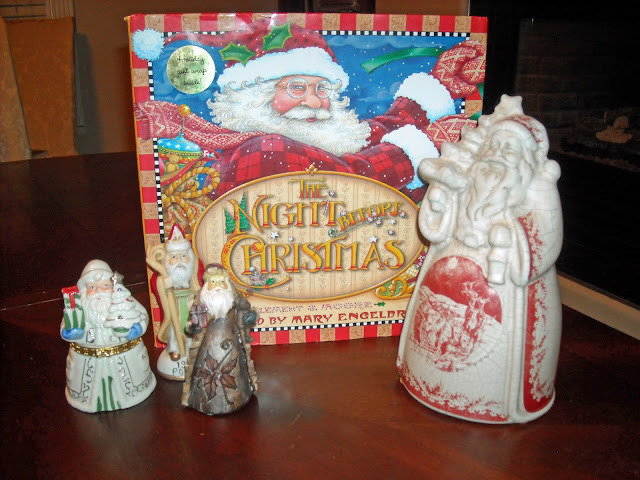 Now really, those who know me know that I am so organzied about Christmas, until now! Normally I am finished with all of my Christmas shopping by Thanksgiving! I haven't even made my cards! :0! I just started shopping LAST WEEK! :0!!! I am not just slacking, really I have just been super busy. I took over a big project for someone else and ended up with one week to put together a Christmas production for a community choir for (over 50) kids! Well, we are almost done- a week from today we have our last performances! It has actually gone quite well! The kids have done a fabulous job! Between this and "An Act of Praise" (the youth choir/drama team I direct) we have had performances every weekend! It will feel good to take a break! In addition to this our own children have had (and still have) various performances with schools (did I mention I have 5 kids! LOL! ) 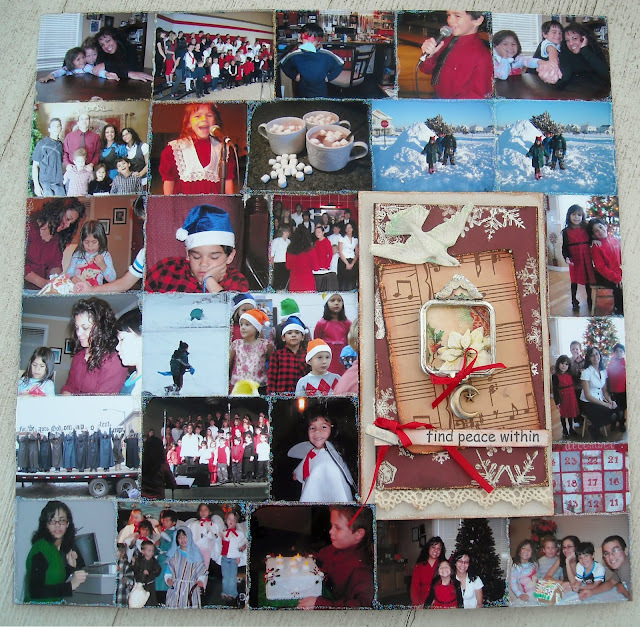 The good thing is that I have been busy all year doing various scrappy projects that I can give to family! This is one of those projects! 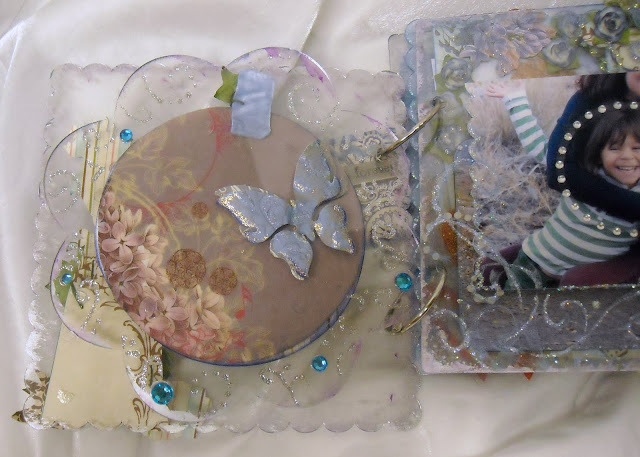 All of the papers in this mini album are from Websters. These papers have so much character that makes it so much fun to use! 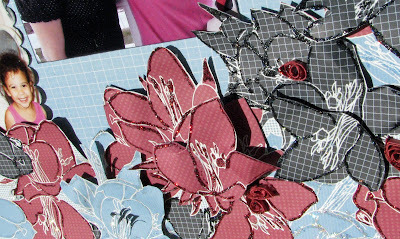 I love cutting up this paper! 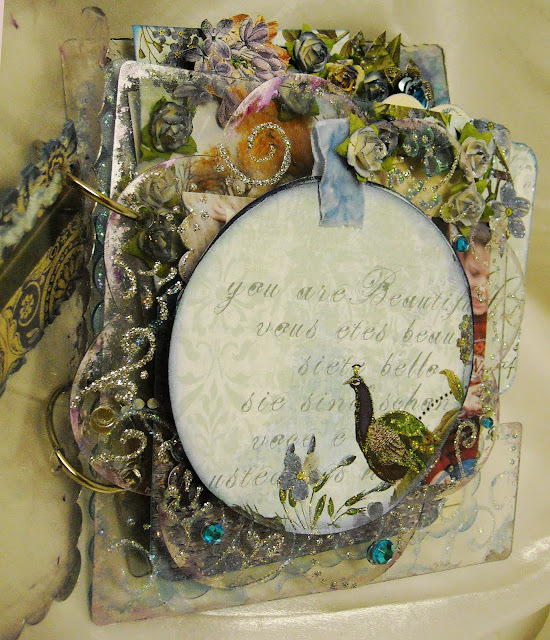 I added lots of Stickles, tiny Prima roses and bling. 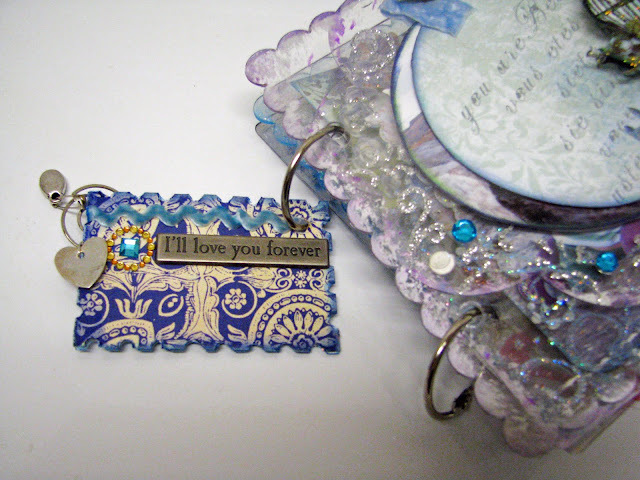 I used Alcohol inks on the acrylic edges and chalk ink on the paper edges. 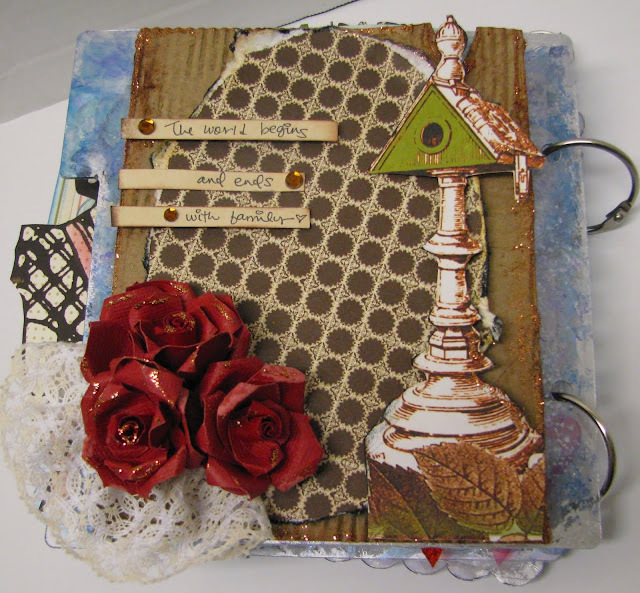 Lots of little flaps and hidden compartments in this book. 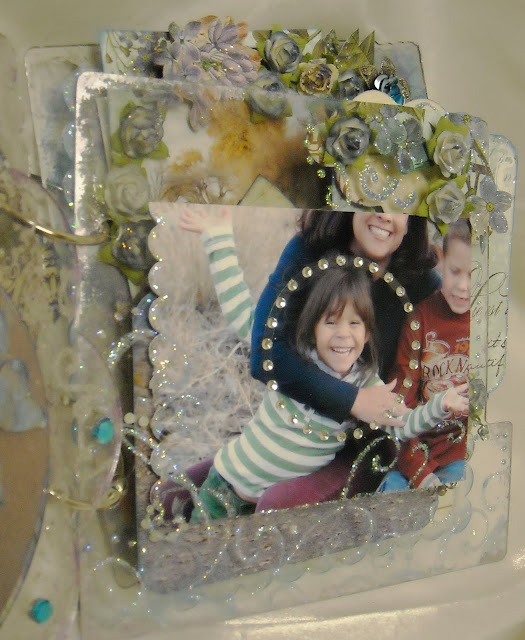 Other products I used are from Making Memories(metal), Basic Grey (rub ons), Fancy Pants (glitter die cuts), Heidi Swapp and Kaiser (bling). 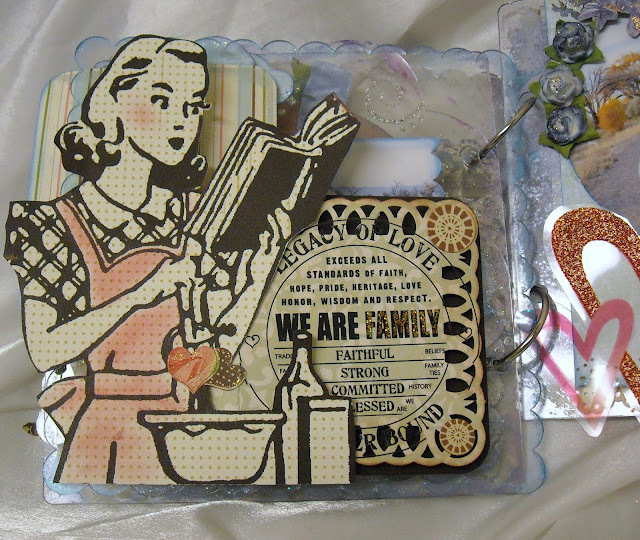 Paper edge punches are Martha Stewart and the acrylic book is actually from several books by Scrapwerks. 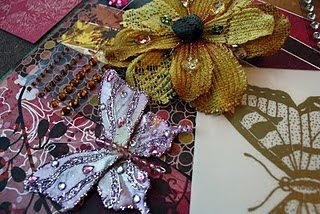 So did you go over to http://www.scrapbookingfromtheinsideout.blogspot.com/ yet? If you haven't you should! 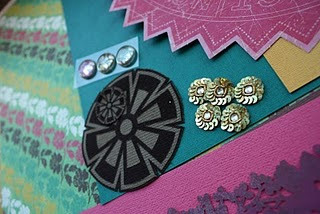 Lots of scrappy goodies to be won over there! Here is another project. 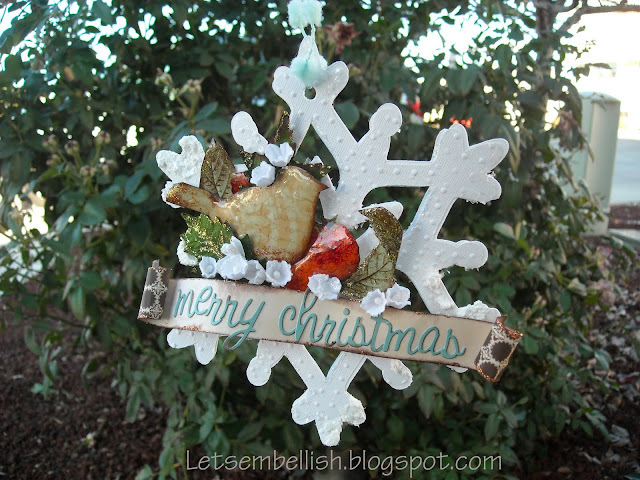 I cut the snowflake with my Cricut and embossed it with my Cuttlebug. 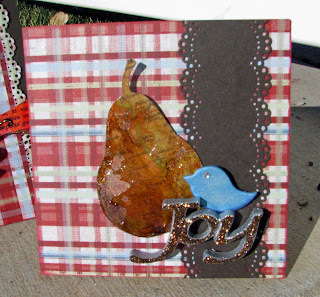 I cut out the bird, berries and leaves from the Websters paper. I used Glossy Accents to make them shiny and added a little glitter. I am also way past staying up all night, and you don't have to do that to be a part of this fun crop! LOL! Well, unless you want to ;) Hope to see you there! 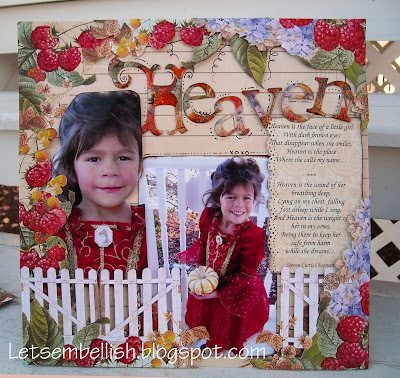 The journal on this layout is from the song "Heaven is the face" by Steven Curtis Chapman. 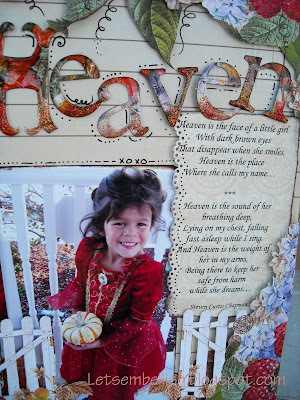 It is beautiful song and I have used the lyrics from this song in two layouts "Heaven" and "My minds eye" . 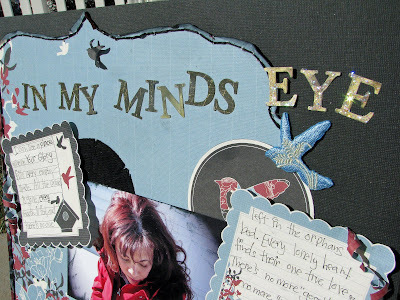 The papers for "My minds eye" are Kaisercraft from the December kit at Scrapbooking From the Inside Out, "Peace". 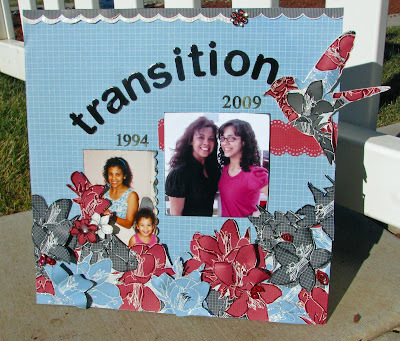 Oh and don't forget they are still giving away fun scrapbooking stuff at http://www.scrapbookingfromtheinsideout.blogspot.com/ !! 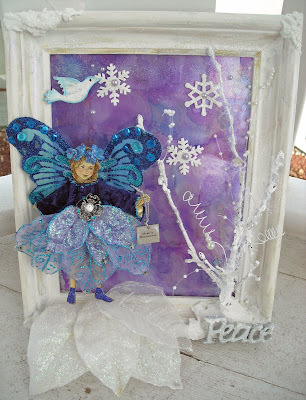 I made this fun little project for my baby girl as she loves fairies! (hmm I wonder where she gets that from?) I painted a fairy land mural on her wall so I thought this will be a perfect addition. As soon as she saw me working on this, she thought she was so beautiful it had to be for her! How could I resist this little face? 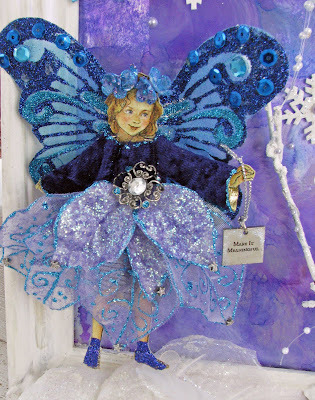 Technique items used; Glimmer mist, Stickles, Snow Tex, Folk Art acrylic paint, Brilliance ink, Alcohol Inks, Martha Stewart glitter. 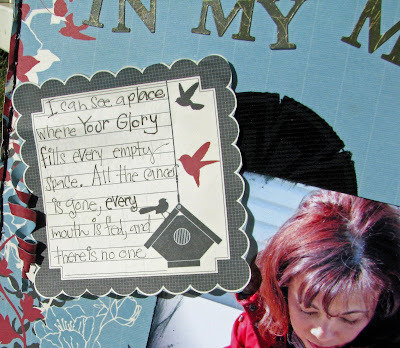 When I saw this cloud paper from College Press I knew I wanted to do something special! 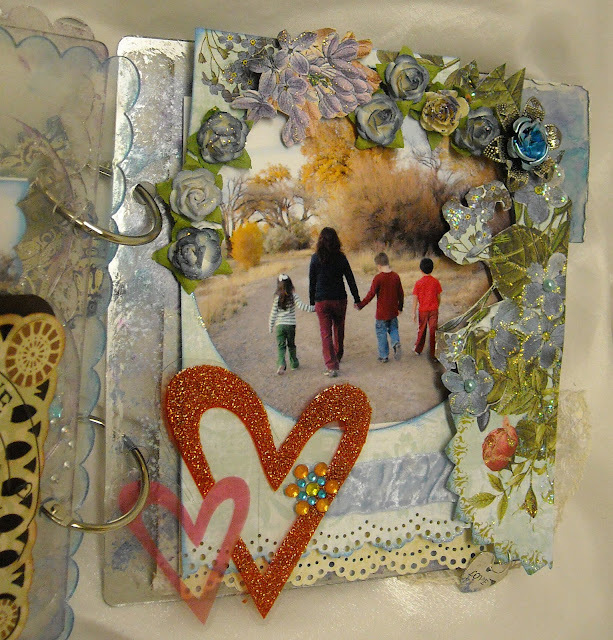 These are more lo's using the Decembers "Peace" kit at Scrapbooking From the Inside Out. Finally…sweet sleep. I cannot remember a time that you’ve slept like a normal child. Most toddlers nap and go to sleep around 7 or 8 pm. You are the only baby I know that could be so sweet and sleep so little. There was a time that we had to medicate you because at two years old you had gone two weeks without sleeping! Since then your earliest bedtime was midnight. Not because we were doing anything, but you just can’t fall asleep. 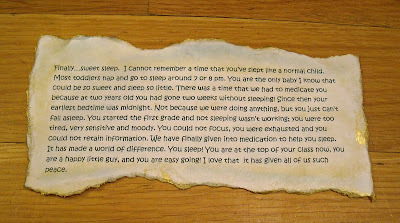 You started the first grade and not sleeping wasn’t working; you were too tired, very sensitive and moody. You could not focus, you were exhausted and you could not retain information. We have finally given into medication to help you sleep. It has made a world of difference. You sleep! You are at the top of your class now, you are a happy little guy, and you are easy going! I love that it has given all of us such peace. And now you know why I call him "night Owl". ***Senior year for my first born has brought on so many thoughts and questions. Did I do a good job? Is she ready for college? Have I given here all the tools she needs for life? I am not ready to let go, and yet I know a part of me knows she will always be my baby. Our relationship is ever evolving, changing by the experiences we both face. ***She is amazing, smart, fun and silly; she does not realize how beautiful she really is. I remember when she was three and could not get enough to read. I didn’t sit down and teach her – it’s something she picked up on her own, a God given gift. Amazing, to this day she reads everything she can get her hands on - quickly with full comprehension. 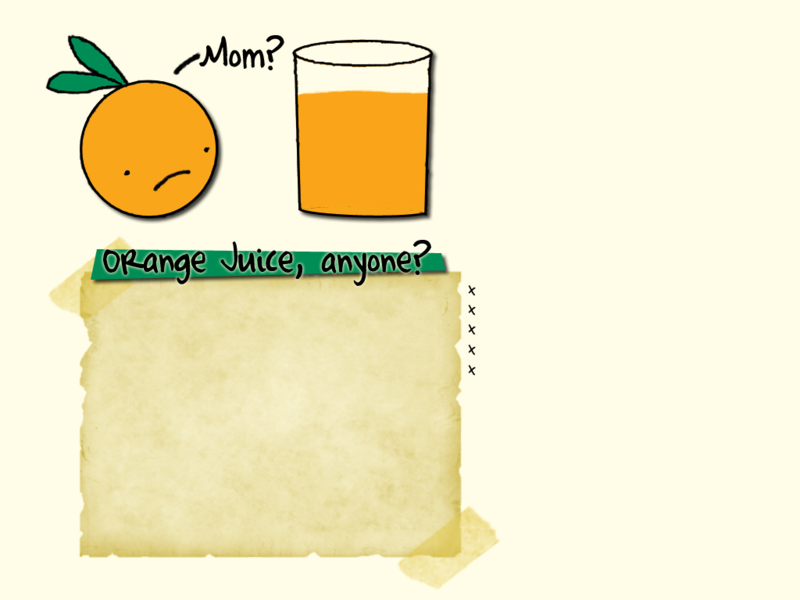 She has her dad’s sense of humor, dry and sarcastic and yet can be incredibly silly. If you speak to her in person you will see that she has many of my mannerisms, she even talks like me. Her dads’ sense of humor comes into play as she teases my friends when they call, pretending to be me on the phone. She knows who she is in Christ. She has deep passion for injustice and the hurting. She is comfortable being a young woman; she is strong and feminine. She stands up for her rights. Is she perfect no, none of us are perfect we all make mistakes but she is good. She will make mistakes on her own; I have to learn to let her. ***We are on the cusp of a new beginning, a different understanding of a familiar relationship. In one month my baby will eighteen years old. Where did the time go? It seems like yesterday she was dressed up like a little bride happy to be dancing with her grandpa or cuddling with her daddy. I am not scared or nervous about her future, I am at peace knowing that we may not have been perfect parents but judging by who she is right now we definitely did something right. 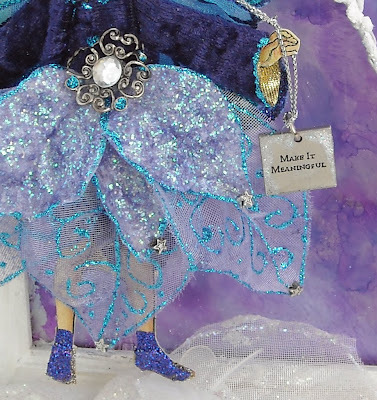 I really love using Glimmer Mists and masks and glitter! 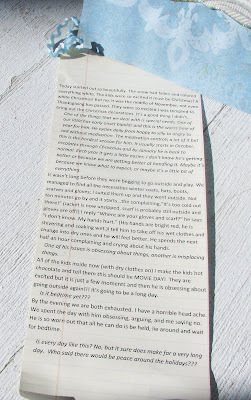 This layout has the hidden journaling in the scroll. I was having a rough day and thought about this layout, it's so peaceful and my day was anything peaceful! It just seemed to work for me and sometimes you gotta get this stuff off your chest! One of the things that we deal with is special needs. One of our little has early onset bipolar and this is the worst time of year for him. He cycles daily from happy to silly to angry to sad without medication. The medication controls a lot of it but this is the hardest season for him. 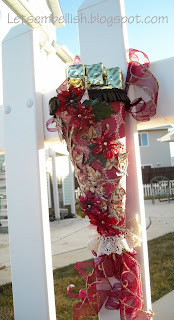 It usually starts in October, escalates through Christmas and by January he is back to normal. Each year it gets a little easier, I don’t know if it's because he’s getting better or because we are getting better at handling it. Maybe it’s because we know what to expect, or maybe it’s a little bit of everything. It wasn’t long before they were begging to go outside and play. 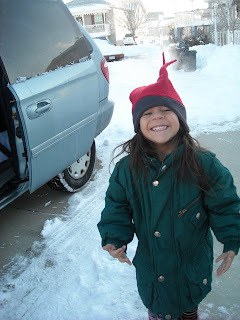 We managed to find all the necessities winter coats, hats, boots, scarves and gloves; I suited them up and they went outside. Not ten minutes go by and it starts…the complaining,”It’s too cold out there!” (Jacket is now unzipped, scarf is probably still outside and gloves are off!) I reply “Where are your gloves and scarf?” he says “I don’t know. 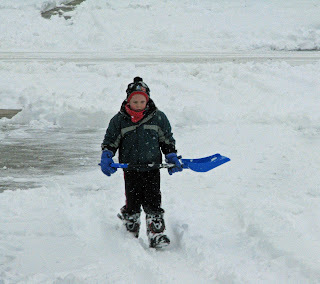 My hands hurt.” (His hands are bright red, he is shivering and soaking wet. )I tell him to take off his wet clothes and change into dry ones and he will feel better. He spends the next half an hour complaining and crying about his hands. One of his issues is obsessing about things, another is misplacing things. 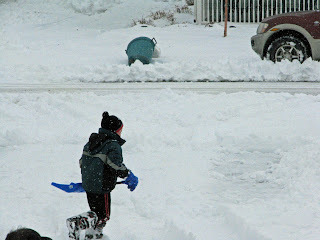 All of the kids inside now (with dry clothes on) I make the kids hot chocolate and tell them this should be MOVIE DAY! They are excited but it is just a few moments and then he is obsessing about going outside again!!! It’s going to be a long day. By the evening we are both exhausted. I have a horrible head ache. We spent the day with him obsessing, arguing, and me saying no. He is so worn out that all he can do is be held, lie around and wait for bedtime. Is every day like this? No, but it sure does make for a very long day. Who said there would be peace around the holidays??? 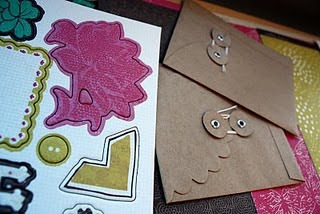 I was able to also make a little card and still have paper left over! 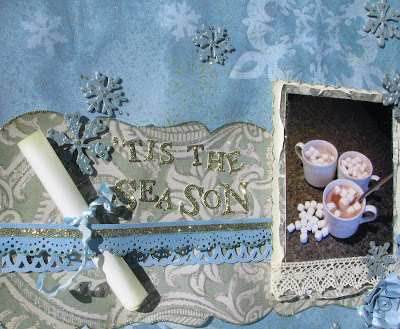 Wishing you joy and peace this holiday season! ***1. 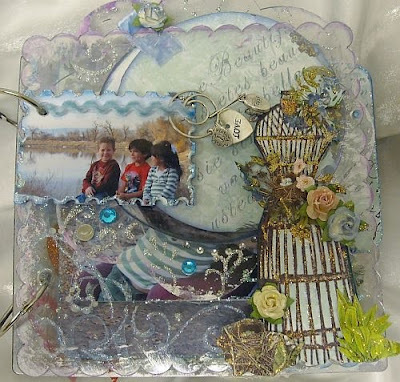 Stop by Scrapbooking from the Inside Out and register for our mailing list on the home page (scrapbookingfromtheinsideout.com - scroll down) if you’re not already a member. If you are, you’re good to go! ***2. 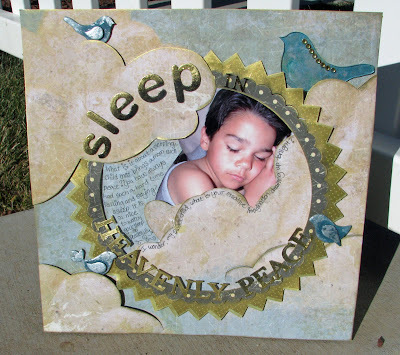 Leave a comment here - http://www.scrapbookingfromtheinsideout.blogspot.com/and let us know if your spiritual choices leave you feeling peaceful...That’s it! We’ll announce the winner tomorrow. You have until Midnight Pacific (Wednesday Night/Thursday Morning) to leave your comment (UTC/GMT -8). 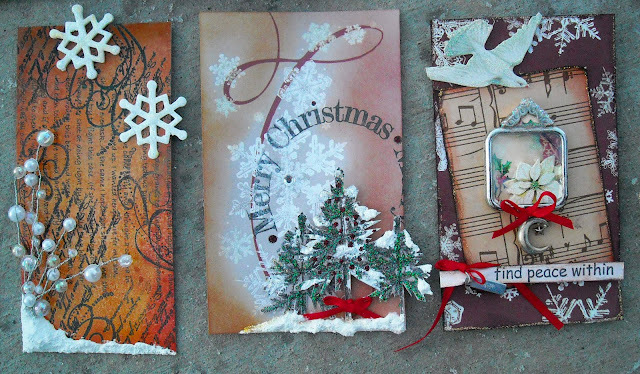 ***Every weekday between now and Christmas, join us for Fa La La La Freebies at SFTIO - great giveaways and inspiration as we highlight some of the best emotion-based layouts we’ve seen this year. Each day you can win something special used on those pages from Scrapbooking from the Inside Out to add to your layouts, and on Christmas Day, you can win our grand prize - our exclusive January kit before it’s available to our subscribers. I am so not kidding when I tell you Rachel puts together an amazing kit!